As one of the premier analytical testing facilities worldwide, specializing in pharmaceutical testing, PTL is adding the Spectradyne nCS1 nanoparticle analysis capability to its comprehensive set of available tools. The nCS1 will enable PTL to perform analysis services for submicron particulates such as protein aggregates, nanomedicines and other nanomaterials in an FDA registered and GMP compliant facility. 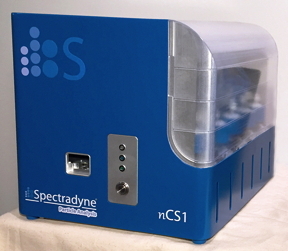 Spectradyne is happy to announce a new partnership with Particle Technology Labs to provide analytical measurement services using its nCS1TM instrument. Particle Technology Labs is a premier analytical testing facility located in Downers Grove, Illinois, that is ISO certified to provide a broad array of measurement services. Spectradyne’s mission is to improve the efficacy and safety of nanomaterials through better metrology. Spectradyne’s technology leverages microfluidics and advanced electrical sensing techniques to measure particle concentration and size with unprecedented accuracy, and requires only a tiny fraction of the sample needed by other methods.